Have a GREEN New Year! As we hit the ground running in 2019, we want to be sure to thank you for your hard work in support of our mission. Speakers Announced for Our Next Great Ideas Breakfast: How Is Our Planet Changing? 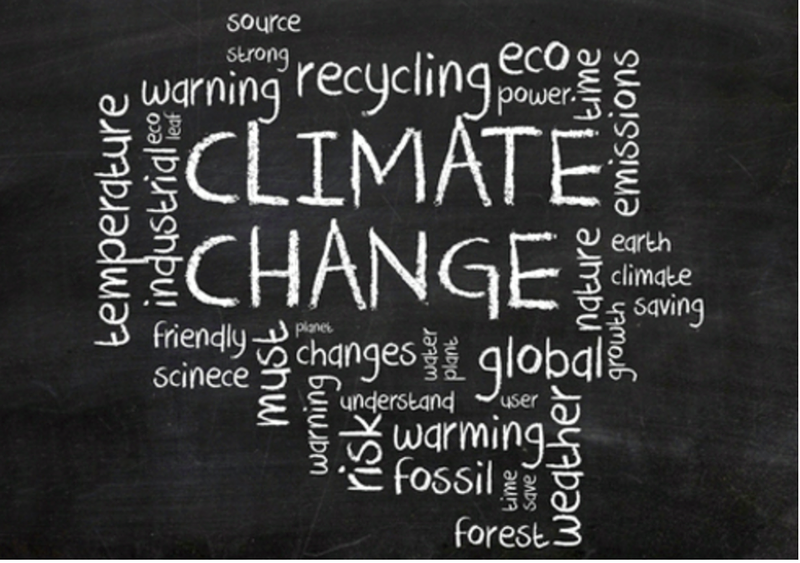 Tackling Climate Change at a State-wide Level & Leveraging the Power of Communities. Randall Solomon has 20 years of experience working in government, academia, and the non-profit sector. He is one of the principals that founded and directs the Sustainable Jersey Certification program. Randy holds a B.S. in Biology from Rutgers University and a M.S. in Public Policy from Rutgers University. Assessing the Risks of Change So We can be Prepared and Resilient. Professor Lin is an Assistant Professor or Civil and Environmental Engineering at Princeton University. She is interested in Natural Hazards and Risk Assessment, Stochastic Modeling, Wind Engineering, Coastal Engineering, Climate Change Impact and Adaptation, and Built Environment and Sustainability. Specifically, her current research integrates science, engineering, and policy to study tropical cyclones and associated weather extremes (e.g., strong winds, heavy rainfall, and storm surge), how they change with climate, and how their impact on society can be mitigated. Jim has served as Executive Director of the Watershed Association since April 2005. He regularly speaks at community events and municipal meetings throughout central New Jersey, serving as a go-to resource for government officials and community leaders on how to best protect clean water and the environment throughout the region. Jim has a biology degree from Princeton University and a Master of Environmental Studies from the Yale School of Forestry and Environmental Studies. Tineke is a climate communicator working to raise awareness about climate change and about solutions leading to climate resilience. She holds Ph.D. in physics from MIT. She writes a blog on fuel efficient cars, and is available for climate presentations tailored to the audience. Scott Morgan is responsible for maintaining tractor and farm equipment; coordinating crop, harvest, and planting schedules; overseeing organic certification and food safety programs; and implementing pest and disease management programs. The breakfast will take place at 8:30 am on Thursday, March 26th at the Princeton Public Library Community Room. Come enjoy a free breakfast catered by Terra Momo Bread Company. As always, the event is free and open to the public as well as a zero waste event. Switch - Every energy resource — fossil, nuclear and renewable — is undergoing profound changes. This sweeping transition is the subject of “Switch” and travels the world to discover how it most likely will happen, with a focus on the practical realities and balanced understanding about changing the way we use energy, to realize the many economic and environmental benefits of efficiency. Racing To Zero - By substituting the word “resource” for the word “garbage,” a culture can be transformed, and a new wealth of industries can emerge, presenting new solutions to the global problem of waste. The film examines how the mayor of San Francisco pledged to achieve zero waste by 2020, and tracks San Francisco’s waste stream diversion tactics and presents innovative new solutions to waste. This film documents a surprising, engaging and inspiring race to zero. Been waiting to get rid of old electronics that have served their useful purpose and are taking up space around the house but don't know what to do with them? Or maybe you've been wondering what to do with paints, cleaners, oils, batteries, and pesticides, or other household substances that contain potentially hazardous ingredients. 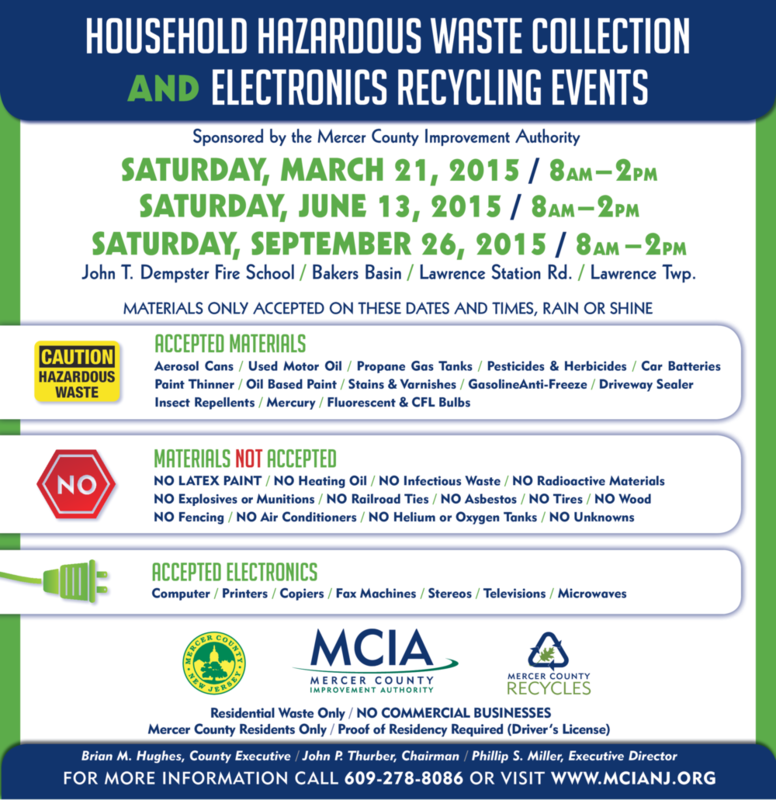 Three times a year the Mercer County Improvement Authority (MCIA) holds a Household Hazardous Waste & Electronics Recycling event for Mercer County residents. Residents with proper identification may bring used electronics, including computers, televisions, printer & household hazardous waste to the John T. Dempster Fire School on Lawrence Rd., Lawrence Township this Saturday, March 21st from 8:00 am - 2:00 pm. Collected products are sent to a recycling facility for processing. More information about recycling can be found anytime with MCIA's my-waste app. Can't make it this Saturday? Princeton residents can recycle computers, televisions, and other electronics at the Convenience Center on River Road. An appointment may be needed to drop off material. Contact Princeton's Recycling Coordinator, Janet Pellichero, at 688-2566 for information Monday – Friday from 9:00 am - 2:00 pm. And while you are getting a head start on spring cleaning, start planning for the Let it Go! community wide yard sale. The Princeton Environmental Film Festival, Sustainable Princeton and The Princeton Public Library have worked together to engage the whole town in an event that focuses on reuse and recycling. All Princeton residents are encouraged to participate by either hosting a yard sale or attending the sales on Saturday, April 25, 2015 from 9:00 a.m.-1:00 p.m.
To host a sale register here. A map of all yard sales in the area will be produced so prospective buyers will know exactly where to find the sales. There is no cost to host a sale and all profits from your yard sale are yours to keep. Registration deadline is April 20, 2015. The Princeton Public Library & Sustainable Princeton are not responsible for items sold or bought by the seller or buyer. The seller is responsible for removing all items from yards or curbs following the sale. IF YOU CAN'T SELL IT, DON'T SEND IT TO THE LANDFILL...TRY THESE RESOURCES. Join Sustainable Princeton and experts from our community as they answer the question, "How Is Our Planet Changing?" Panelists will explore the issue from economic, scientific and practical viewpoints. The breakfast will take place at 8:30 am on Thursday, March 26th at the Princeton Public Library Community Room. Come enjoy a free breakfast catered by a locally owned business. Check back as speakers are announced. As always, the event is free and open to the public as well as a zero waste event. On Monday March 23rd at 5:00 pm and Thursday, March 26th at 10:00 am, the Princeton Public Library's Environmental Film Festival will be showing Switch. This 2012 documentary explores the question of how we will transition from traditional energy sources such as coal and oil to renewable sources. The Washington Post calls it "Smart and refreshingly free of hot air." The film is part of a project that seeks to educate about energy conservation and efficiency. In anticipation of the film's showing, Sustainable Princeton will share an energy efficiency tip each day from the project. Check our Facebook page & Twitter @sustainptn to get your energy efficiency tip of the day and be sure to come see the film at the Festival.